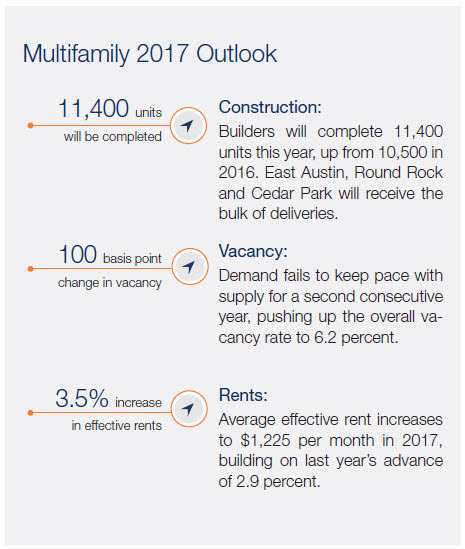 ​​​​​​AUSTIN – Stable local demand drivers have spurred multifamily builders to move forward with thousands of units, reports Marcus & Millichap in its latest multifamily market update. Local home price appreciation continues to outpace most of the nation. Household income growth is sluggish, further reducing the number of prospective homebuyers. These factors are keeping many residents in apartments. Though apartment demand will strengthen this year, overall market vacancy will rise as new construction outstrips absorption. The uptick in deliveries could spur an increase in concessions, keeping effective rent growth below the average annual gain of the past five years.